Aug 23-24 “Glow Paddle” Seats Still Available! Water lovers are welcome to join this unique circumnavigation of Manhattan! NO TICKET FEE, just volunteer a few hours for the American Foundation for Suicide Prevention! We have spaces free for HarborLAB’s overnight circumnavigation of Manhattan by kayak! We will paddle from sunset, August 23 (Saturday) until Sunday morning, August 24. 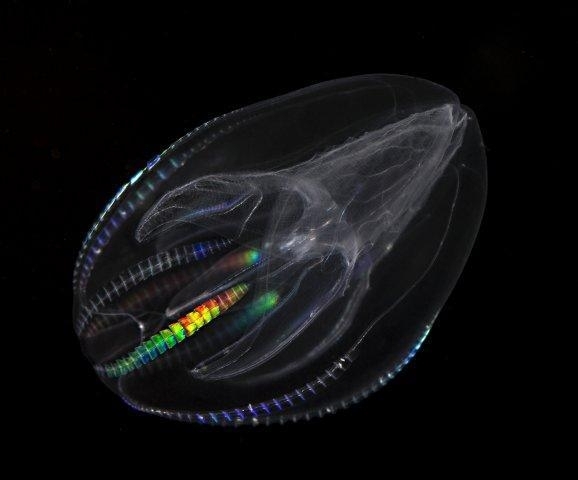 Let’s look for bioluminescent comb jellies! All we ask in return is that you commit to six hours of volunteering for the American Foundation for Suicide Prevention sometime before next June. One great opportunity to support the American Foundation for Suicide Prevention this autumn will be the “Out of the Darkness Walk” on Sunday, October 26. All participants can arrange for AFSP volunteering or joining the walk by emailing Gail Tuohey at GTuohey@afsp.org. Steady volunteers, environmental partners, and college students have first priority, but we expect to have additional seats. Those with their own boats are welcome to join us if approved by the trip coordinator. Please also email tours@harborlab.org. 6PM: Volunteers prepare boats at the HarborLAB home launch (53-21 Vernon Boulevard) and paddle the fleet over to Gantry Plaza State Park. 7PM: Public participants gather at Gantry Plaza State Park’s fishing pier at the end of 50th Avenue. 8PM: LAUNCH! Paddle along the east channel of the East River past Roosevelt Island. Pause at Blackwell Lighthouse to cross. 9PM or so*: Pause to drift and rest at the start of the Harlem River. 1130PM: Leg stretch rest stop at the Peter Jay Sharp Boathouse on the Harlem River. 130AM: Upper West Side wee hours snack run. Pull out at 79th Street Boat Basin. 45 minutes. We usually get pizza on Broadway. 430AM-530AM: Round The Battery within this tidal current window. Cross to Brooklyn. Relaxed breakfast break in DUMBO. 8AM: Return to Hunters Point, LIC! Landing at either Gantry Plaza State Park or preferably the HarborLAB home launch. SAFETY NOTICES: This trip crosses through large vessel channels and greatly varying water conditions. It also requires moderate endurance in terms of fatigue and discomforts (some might blister without gloves, others might get chilled without an outer layer. We must pass active ferry and cruise docks and piers, federally designated security zones, fixed objects in strong currents (buoys, rotting piling fields, ice breakers, etc. ), and we must reach critical tidal current points on schedule. Participants must be able to swim and have some paddling experience. While two days without rain will have passed before this paddle begins, please be very mindful that rains can sweep pathogens into our estuary from the streets and sewers. If you believe your immune system might be compromised, consult your doctor before such outdoor and waterborne activities. Participants must inform HarborLAB of any medical conditions that might become a factor. These conditions needn’t exclude you from the activity, but our knowledge of them will speed a fast and effective response by volunteers or first responders. Pay attention during the safety brief before launch. Obey trip coordinator and escorts immediately. Remain close together so that our group travels as a unit. We keep a diamond formation with volunteers at point, sweep, and flanks. Bring a hat, sunglasses, and sunblock — there’s a lot of sun glare in the morning on the East River. If you have a submersible marine radio, bring it but defer to the trip coordinator for all Channel 13 communications. If you feel you might blister, get bicycling or kayaking gloves. Wear nylons and other quick-drying materials. Bring a dry change of clothes and a nylon outer layer. Put electronics and change of clothing into a proper kayaking or diving dry bag. Do not rely on zip locks and plastic bags. Wear water-suitable footwear. We might also scramble over some moderately rough terrain. Bring a waterproof flashlight if you have one. Attached all belongings to your boat. GEAR: We highly recommend NY Kayak Company (a small, local company that’s very supportive of community water access), or environmentally-conscious major retailers like REI or EMS for your gear needs, such as gloves, dry bags, and quick-drying clothing. Other sports retailers will also likely have these common items.